At least 18 people have been killed in several shootings in the French capital, Paris, as well as explosions at the Stade de France. At least one man opened fire with an automatic gun at the Petit Cambodge restaurant in the 11th district. Liberation newspaper reports shootings near the Bataclan arts centre. Three explosions are also reported outside a bar near the Stade de France, where France were hosting Germany. Reports say French President Francois Hollande was watching the match and has been moved to safety. Live: Follow the latest developments here. A BBC journalist at the Petit Cambodge restaurant says he can see 10 people on the road either dead or seriously injured. He says police have now arrived and sealed off the area. An eyewitness told Liberation he had heard more than 100 rounds being fired. It says the gunman has fled the scene. Paris’s deputy mayor says it is too early to say if the attacks were coordinated acts of terror, but that it looks that way. US officials state the attacks were coordinated. I was on my way to my sister’s when I heard shots being fired. Then I saw three people dead on the ground, I know they were dead because they were being wrapped up in plastic bags. The latest reported death toll is 30. A French Algerian killed three soldiers, a teacher and three young students at a Jewish school in Toulouse. He was later killed by police during a siege at his flat. A convert to Islam named as Alexandre Dhaussy stabbed a French soldier in the neck at La Defense in Paris. The soldier survived the attack. Joue-les-Tours: A French national born in Burrundi attacked several police officers with a knife shouting “Allahu Akbar” (Arabic for “God is great”). He wounded three officers before he was shot dead. Said and Cherif Kouachi shot dead 12 people at the offices of satirical magazine Charlie Hebdo, including some of the publication’s famed cartoonists. 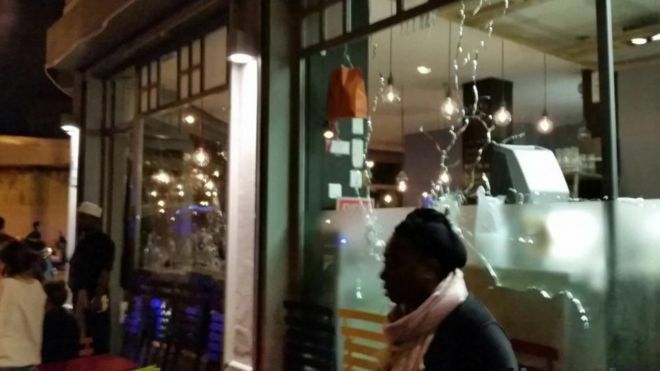 Amedy Coulibaly kills a policewoman before entering a Jewish supermarket in Paris where he shot dead four others. Coulibaly and the Kouachi brothers died in separate shoot outs with police. Three soldiers on a patrol outside a Jewish community centre in Nice are attacked by an armed man. He stabbed one officer in the arm and slashed the cheek of another before he was arrested. Saint-Quentin-Fallavier: Two attackers entered a chemical factory near Grenoble with the aim of setting off explosives. One man was beheaded and several others were injured. One suspect was arrested. A black flag with Arabic writing was found on the scene and President Francois Hollande described it as a terror attack. The men came in and started shooting. Everyone fell to the ground. It was hell. It’s a nightmare – a nightmare. At least 18 people were killed and “many wounded” in a series of attacks in Paris by gunmen armed with kalashnikovs and grenades on Friday evening, police said. Grenades were reportedly thrown at a stadium in the north of the French capital where a football match between France and Germany was being held, witnesses said. The first shooting to be reported took place at a Cambodian restaurant in the 10th arrondissement of the city, an area with many crowded bars and restaurants, particularly busy on Friday evening. A second shooting was reported minutes later near a nightclub in the area, Le Bataclan, where gunmen were said to be holding hostages. Later grenades were said to have been thrown at a stadium in the north of the city where a football match between France and Germany was being held. 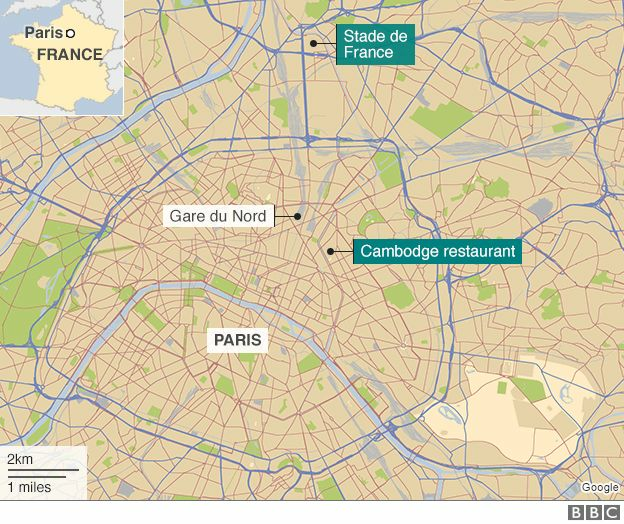 Large numbers of police rushed to the scene of the first attack, a Cambodian restaurant in the 10th arrondissement of the French capital. They evacuated nearby bars and restaurants. The motive of the shootings is unknown, but Parisians feared that terrorists had again attacked the French capital, where 17 people were killed in a series of attacks in January that began with the shootings of staff at the office of the Charlie Hebdo magazine. Sirens were heard throughout central Paris. Helicopters were seen in the air near the stadium.